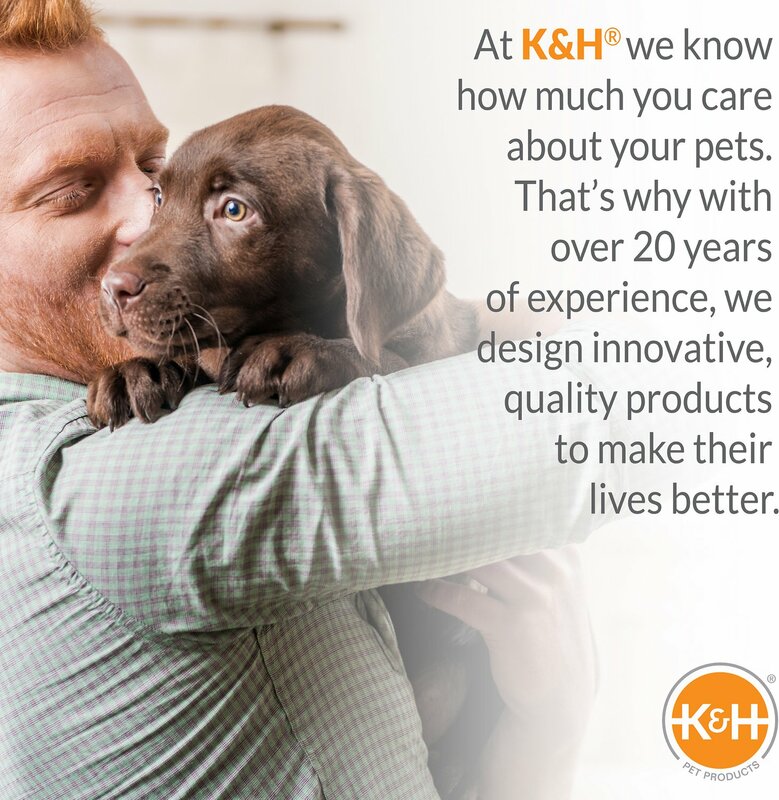 Your pet will sleep soundly on the K&H Pet Products Feather-Top Orthopedic Pet Bed. 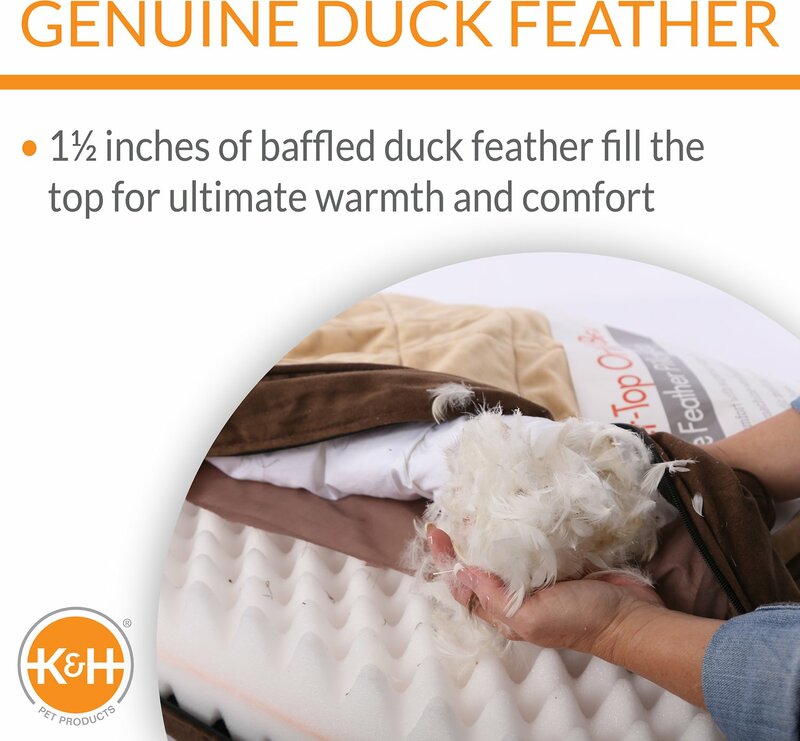 With a 5 inch medical grade foam base and a 1.5 inch baffled duck feather top complimented with micro-suede, this bed provides a deeper and more restful night’s sleep by gently cushioning your furry friend’s pressure points like his hips and shoulders. 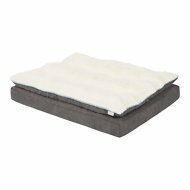 Between the cushioned sleeping surface and the comfort of the medical grade foam, your furbaby will be sleeping in luxury. 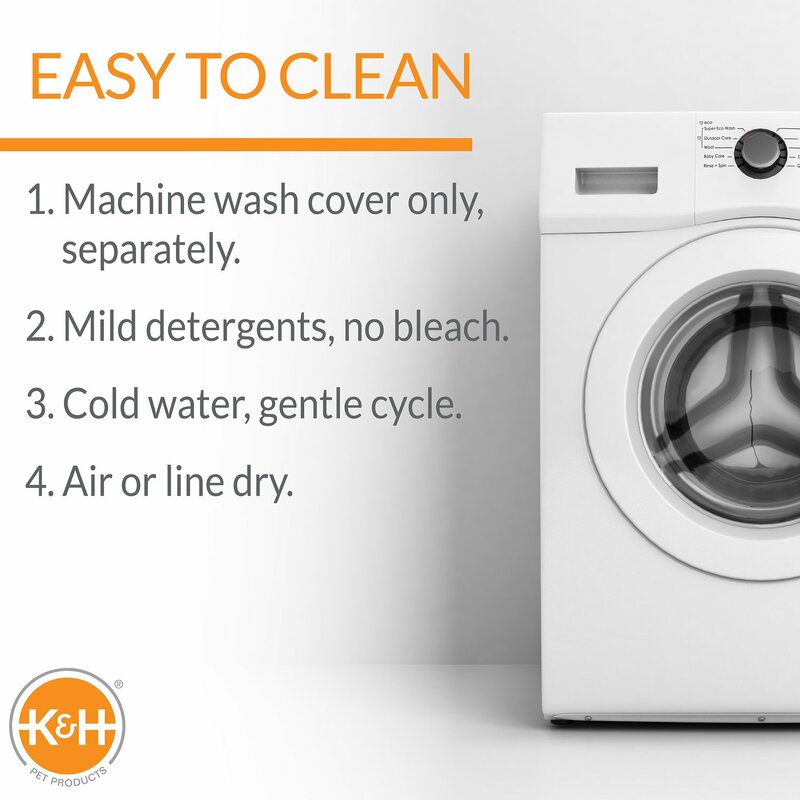 Plus, the cover is removable making washing a breeze—just throw into the machine on a cold, gentle cycle. Base is made of 5 inch orthopedic, medical grade foam and has a 1.5 inch baffled duck feather top. 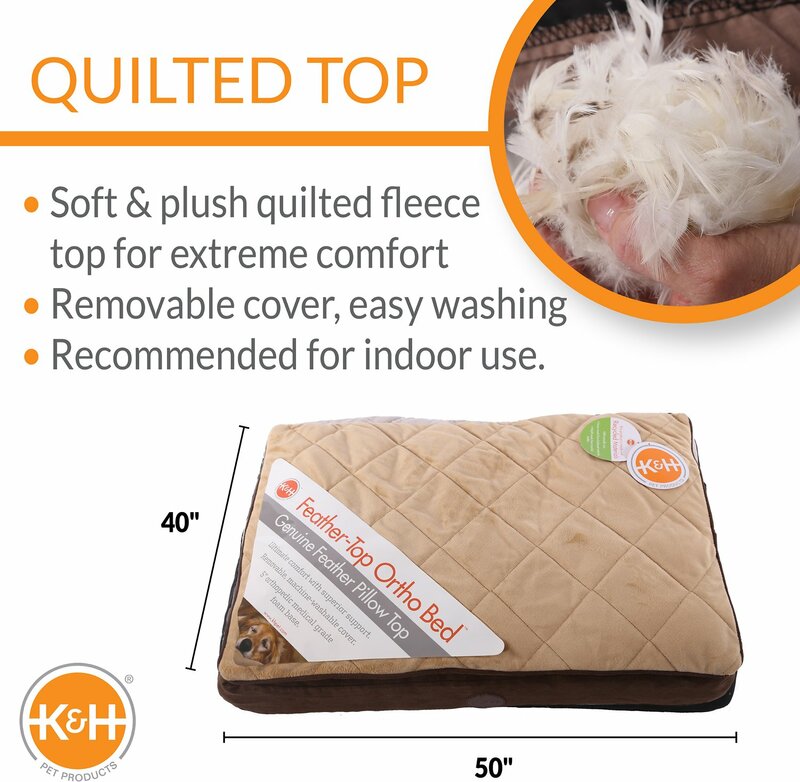 Super soft micro-fleece sleeping surface is gentle to the touch and hugs your pet while he slumbers. 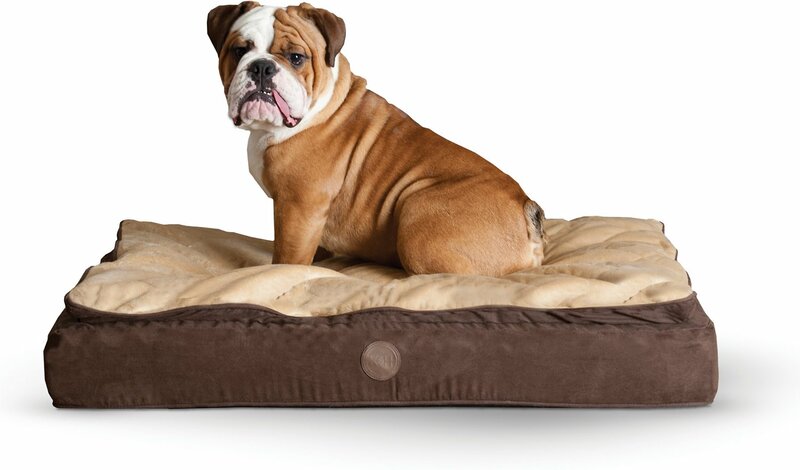 Orthopedic design cushions your four-legged friend’s pressure points like his shoulders and hips. Attractive two-tone design is sure to fit in with any home décor. Removable cover makes it easy to clean, just toss it in the washer on gentle cycle with cold water and use the no-heat cycle on your dryer. Washing Instructions: As with any feather bed, you don’t want to wash it frequently since this will break down the feathers inside. Please make sure to always wash in cold water on gentle cycle with a mild detergent such as Woolite®. Never use bleach or fabric softener with any feather bed, as this also contributes to the breakdown of feathers. Dry on the no-heat cycle or with very low heat. What type of foam base does the bed have? The Feather-Top Ortho Bed has 5 inches of medical grade orthopedic foam. I could not be more pleased with this bed. I purchased it for our 16 yr old Maltese, Katie. I wanted a bed which would provide the most comfort for her in her old age. This bed is just wonderful...supportive and yet so comfortable. Best of all, Katie loves it. Big Enough for ALL the Dogs! I purchased this bed for two large Boxers and three Chihuahuas, I also purchased a pet bed warmer to go inside and they are on it most of the day! I thought it was a little pricey but I would happily spend it again! I got the XL bed, hoping it would be big enough for both my pups, and yes it was. They are both medium sized. It is so soft and padded. It's almost better than my mattress. Really helping an old dog with a hip injury. Huge improvement in her comfort and mobility since she has been using it. This bed is very good quality. I bought it for my husky who is 7 years old and starting to get stiff when he lays for a long period of time. The bed he was laying on before was lumpy so this is a great upgrade for him. Make sure you really look at the dimensions of the bed size you want. I thought I would get the large for him but when I broke out a tape measure I realized the bed was humongous! So I got the medium, and its the perfect size for him! He is able to curl up and sprawl out. Long story short, I highly recommend this bed and just make sure you look closer at the dimensions to make sure you choose the right size that will work for you and your dog! Shyla jumped on it right away! It's pretty comfy for her and plenty big enough. She likes to sprawl and as you can see, even only partly curled, there's plenty of room for her to stretch out!! The box it came in is huge too...too big for the cats to consider it fun. Lol Shy is about 90lbs and by no means does she sink to the floor...not even when walking on it to lay down! I would buy her another one but it's too big for our living room at the moment. When she starts to have trouble getting on the loveseat, then we'll be placing another order for this awesome bed!! From the snoring on the floor, I'd say she is one happy dog!!! Big Bed for long dog! Headline says it all. My puppy is 38 inches plus long. Needs a long bed. Our Great Dane absolutely loves his new bed! It is a great size for our 165lb boy. It is great quality and holds up under his weight very well. We are getting ready to purchase another one to keep on our second floor so he can be comfy wherever he is.